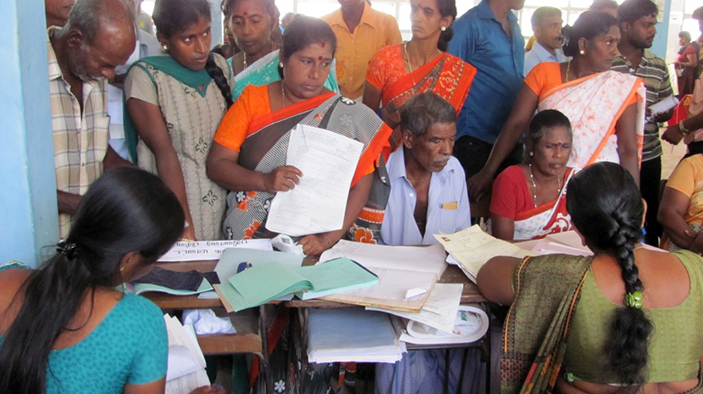 On September 21, residents in Northern Sri Lanka cast their ballots as part of an historic event—the first-ever Northern Provincial Council Elections. Election Day turnout was extremely high at 68 percent, representing a dramatic increase from previous years despite a very tense electoral environment. The U.S. Agency for International Development’s Office of Transition Initiatives (OTI) supported the landmark event through the Reintegration and Stabilization in the East and North (RISEN) project as the culmination of three years of work helping marginalized, conflict-affected communities in the North. Through partnerships with three local organizations—Campaign for Free and Fair Elections (CaFFE), Centre for Human Rights (CHR), and Home for Human Rights (HHR)—RISEN helped citizens province-wide to understand why and how to vote, enabled many to acquire the identification documents required to do so, and ensured their trip to the polls would be observed by trained, non-partisan monitors. In advance of the vote, the OTI project, led by DAI, funded the election’s largest monitoring program to document and counter electoral misconduct. This effort culminated in the Election Day deployment of 868 monitors throughout the province, 640 of whom were trained with project support. These monitors were present at 99 percent of the polling stations and comprised more than half of all monitors in the Northern Province. They noted 48 reports of misconduct (14 involving violence) and served as a leading source of information for media. In the weeks leading up to the election, project partners organized interactive voter education activities to engage citizens in their own communities. Through street drama performances across 38 villages, the project disseminated messages to encourage participation and to offset inaccurate information about voting. Meanwhile, 48 community dialogues, 38 youth leadership clubs, and eight district-based civil society roundtables brought together a total of more than 12,000 citizens to learn about the importance and process of voting. To further this message, partners distributed printed materials, including more than 100,000 posters, and 50,000 leaflets and bumper stickers. This information campaign was responsive to events; when rumors spread that the government could track how people voted, the project responded swiftly with a campaign of 8,000 posters reaffirming the confidentiality of voting. RISEN also used these voter education efforts to publicize and promote a parallel activity for the provision of identity documents. To vote in Sri Lankan elections, registered voters must present a valid National Identity Card (NIC) at the polling station on Election Day. In the Northern Province, this requirement presented a significant hurdle, as an estimated 85,000 registered voters lacked a NIC as of early summer. In response, RISEN organized mobile clinics that enabled the request, processing, and delivery of 21,225 new NICs (as well as thousands of birth certificates and other critical documents)—a number equivalent to roughly a quarter of all northern voters registered but without valid ID.